industries. 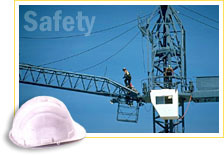 Safety incidents/accidents involving cranes, excessive equipment down time, and high operating costs are indicators that question the effectiveness of the existing Crane Maintenance Programs. An audit of all elements of the programs in place is the best method to determine where there are weaknesses in the programs, and more importantly, to indicate what can be done about them. An audit conducted by Crane Inspection Services, Inc. can determine what corrective measures are necessary to improve the programs. The audit includes, but is not limited to, review of crane accidents, equipment selection, acceptance testing, inspection, maintenance, operational requirements, operation and supervisor training and qualifications. The audit could include an on-site observation of lift practices and selected equipment inspection. The final day of the audit consists of an on-site briefing involving the responsible management personnel pertaining to the findings and specific recommendations for program improvement. If you have doubts about your program or have had several incidents involving cranes, a delay in having an audit conducted by the specialists at Crane Inspection Services, Inc. could be costly.